Stamping into the Night: Never too young to stamp! Never too young to stamp! My 20 month old granddaughter is a delight and the joy of my life. She has such an imagination. About 2 months ago I was visiting her and my daughter. We were in my daughter's stampin' room making cards. She loves to stamp with us. She gets up on a little green stool and pretends to use glue runners and stamps. She soon realized that we were actually stamping with the stamps and wanted ink on her stamps. I asked her if she wanted to make papa a card. She nodded her head and brought her markers to me. I helped her write her name and she scribbled all over the card. I tried to fold it up and she wouldn't let me. She kept saying stickers, stickers. I didn't think she had any stickers but she did. It was the leftovers from a book of USPS stamps. She stuck those all over her card and then helped me fold it. She was so proud of her self. 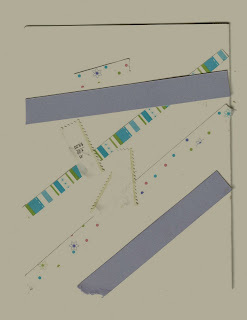 Here is OJ's card, I thouhgt I would be the first to publish her work. I even thought about offering to do a stamp camp using her very special designs. Everyone will want to come, don't you think. I am a Stampin' Up Independent Demonstrator and now that my hobby is my job I love sharing what I love this others. I signed on with Stampin' Up in March, 2007. I am a grandma to one beautiful baby girl and lovin' it. I, also, am a three time breast cancer survivor and I am sooo glad I am still here to enjoy life. I will be posting some of my current projects and some mini tutorials soon. So, come back often so we can get to know each other better. 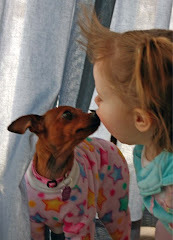 My Grand Daughter and Dutchess, my 3.5 lb miniature pinscher and constant stampin' companion.